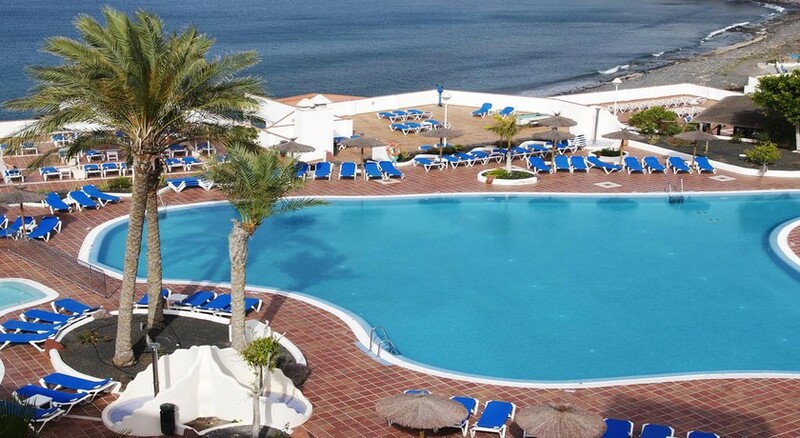 Located on the scenic Papagayo beach in Lanzarote, the Sandos Papagayo Beach Resort is a four-star luxury property welcoming tourists with contemporary rooms, swanky bars and restaurants, lively pools and a host of recreational facilities. A comfortable stay amidst beautiful surroundings is what the resort promises, which ultimately makes it popular among all types of travellers. The resort has guestrooms in seven categories suitable for couples, families and groups. Go for a relaxing swim in the adult’s pool, while the children play in the children’s pool. Savour international, Mexican and Asian cuisine or sip a drink at one of the bars. Sandos Papagayo Beach Resort is the perfect retreat to enjoy your holiday in ultimate luxury. 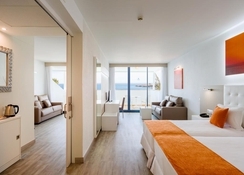 Conveniently situtated in Lanzarote, Playa Blanca, the Sandos Papagayo Beach Resort is 600 metres from the famous Papagayo beach and 5.4km from Playa Blanca fishing village. If you are waiting to experience a magnificent volcanic landscape, then go to the Timanfaya National Park, which is only 23.6km. 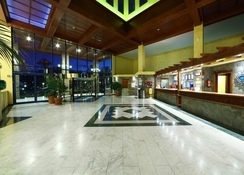 The Lanzarote Airport is 31km from the hotel, making it convenient for the guests to board their flights on time. Sandos Papagayo Beach Resort has guestrooms of the following types: Superior, Superior Sea View Room, Family Room, Royal Elite Sea View and Royal Elite Junior Suite. All rooms are equipped with air conditioning, balcony, en suite bathroom, shower, bathtub, hairdryer, telephone (extra cost), mini bar, TV with satellite, coffee/tea maker, furnished balcony, bathrobes and slippers, candles in bathroom, nightly turndown service, laundry service (extra cost), cot (extra cost), iron and ironing board (extra cost) and bath with Hydro-massage. The hotel has four restaurants with varying cuisines— Royal Elite Restaurant, Venetto Pizzeria, International Buffet and Fusion Restaurant. For savoring both local and international drinks, you can head to one of the bars in the hotel, including Pool Bar, Plaza Bar, Chill out Terrace, Theatre Bar, Canario Bar, Snack Grill and Green Bar. The resort has plenty of activities and entertainment for adults, teens and children. Some of the facilities in the hotel include outdoor swimming pool, shuffle board, archery, soccer, tennis, basketball, water polo, table tennis, darts, miniature golf, Olympic games, jenga, kubb, molkky, billiards, shuffle board, inflatable slides (available only in summer). When adults are busy in one of these activities, the kids can hit the mini disco (every night from 8:30pm) and dance with the entertainment team. Hit the state of the art gym with expert trainers or head to the hydrotherapy circuit for promoting physical well-being. Other than this, you can avail massages, beauty treatments, facial treatments and body treatments at the spa. *** WiFi is free in all public areas. *** Inform the hotel in advance in case you have mobility issue. Friendly immaculate and spacious. Used the spa three times in the week due to the relaxed and informal feeling. Enjoyed a lovely short break at Sandos Papayago, very well run hotel, lovely rooms, great food and great location a little out from the resort but regular courtesy bus. Lovely spa. This was the second time at this hotel in 6 months and not disappointed everything was good. Very clean rooms fantastic choice and quality of food. Staff very helpful and friendly. Nice walk into Playa Blanca. This is an excellent 3/4 star hotel but by far the best (stunning) location and value for money. Rooms, facilities and staff all great. There is a wide variety of good food , though, at times, could be hotter. Rooms are a good size, most with sea views and all areas are kept clean. 3 pools, gym, Jacuzzis, pool and snack bars. Plenty of entertainment. Have stayed 3 times this year and will return. Amazing. Well above what we expected. Another fine stay. Thank you. excellent holiday would recommend to all.